While Bitcoin cryptocurrency stocks don’t yet exist, you can still invest in Bitcoin and avoid most of its huge volatility by going through companies utilizing cryptocurrencies and blockchain technology. Despite what many are calling a crash in cryptocurrencies, the SEC believes they are here to stay. “Sixty-six million tons of American soybeans were just handled through a blockchain transaction by the Dreyfus company to China. So Bitcoin is now being used, it’s being used in our American transportation and logistics system,” Christopher Giancarlo, chairman of the Commodity Futures Trading Commission (CFTC), said in a Senate Banking Committee testimony as reported by Fortune. In this article, we’ll examine several different stocks that allow you to invest in the cryptocurrency space without having to take on the high risk involved when investing directly through cryptocurrencies. Longfin Corp. (LFIN) is fintech that enables global trade finance solutions for a variety of companies by utilizing blockchain technology and cryptocurrencies. The blockchain is used with smart contracts. The company was listed on the Nasdaq at the end of 2017. It traded to a high of $72.38 and now sits at $34.00. Yahoo! Finance doesn’t show any financial statements for the company but the company website does list them. From 2014 to 2017, the company grew revenues from $1.1 MM to $40.3 MM. After-tax profits grew nearly 10X during this same time span. Income for the fiscal year 2017-2018, which are unaudited, show revenue slowing to $28.1MM and profits of $1.1MM. Even though cryptocurrency related stocks are less volatile than trading cryptocurrencies, all of the news and hype tends to bleed over. After LFIN’s initial stock price spike, which created a quick $3.1 billion in market cap, the CEO and chairman, Venkat Meenavalli, said the stock price was not sustainable. This kind of volatility is simply one of the characteristics of the cryptocurrency space. Cryptocurrency stocks tend to have periodic spikes than settle down after a few days. Whereas cryptocurrencies are constantly whiplashing traders. Overstock.com did an ICO (initial coin offering) at the end of 2017. Overstock.com offers both a cryptocurrency and exchange, which is called tZero. It has already been approved by the Securities and Exchange Commission (SEC) as an alternative trading system (ATS). 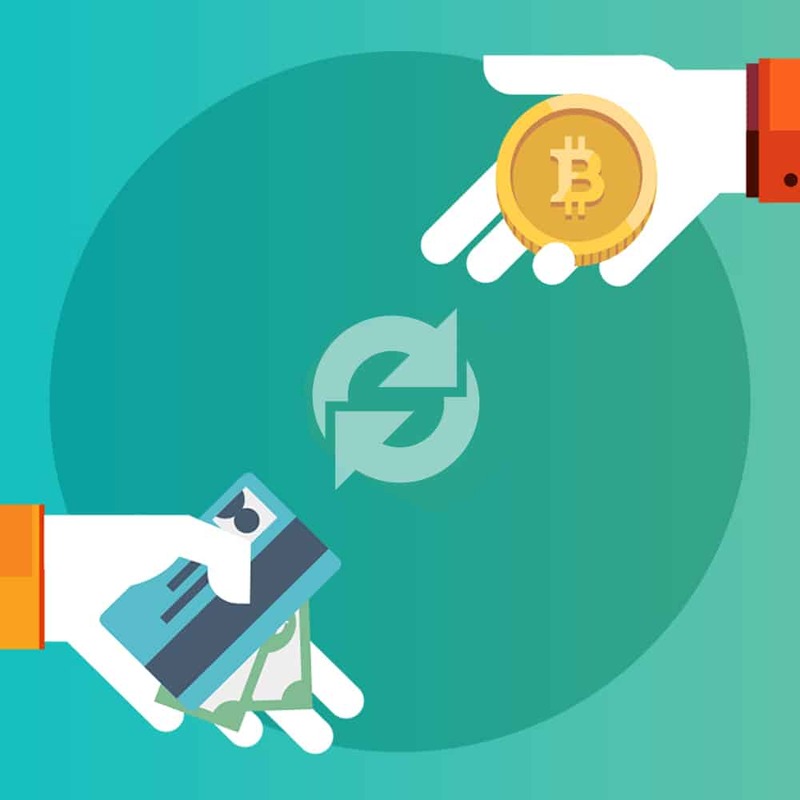 The retailer also allows customers to pay for their merchandise in bitcoin. The company’s CEO, Patrick Byrne, is excited about the technology. “What I saw was the thing that was underneath bitcoin, this invention called blockchain. It’s going to change the world. It’s bigger than the internet. I wanted familiarization with it, so I started accepting bitcoin so that I could get a team of developers to learn about it,” Byrne said in an interview with FOX Business on December 20, 2017. Byrne plans to sell off the retail business and continue utilizing blockchain technologies. Overstock.com's stock began rising in the middle of 2017 from the mid-teens to its current price of $58.60. The company is growing both its top and bottom lines. From 2014 to 2016, revenues grew from $1.5 billion to $1.8 billion while earnings grew from $8.80 MM to $12.5 MM. While pure bitcoin ETFs aren’t yet available, there’s one ETF that has done a good job of following bitcoin’s price moves. 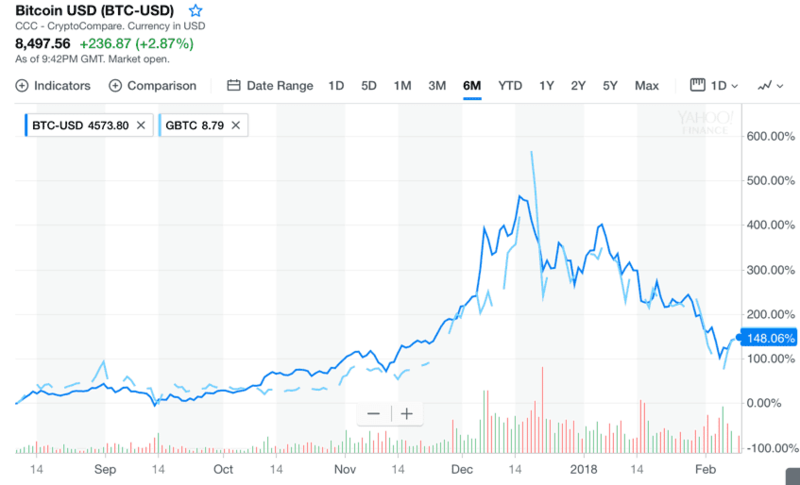 Grayscale’s Bitcoin Investment Trust (GBTC). Over the last six months, the trust has traded from $6 to a high of just over $38. The trust does carry a 2% annual fee. GBTC does split. On Jan. 22, 2018, it split 91-for-1. This means that shareholders will receive 90 additional shares for each share they hold. You can invest in it for as little as $5 on Stockpile. We'll give you $5 for free when you sign up for Stockpile through this link. If you want to avoid bitcoin’s volatility, now you have four different choices with a little analysis on each to help you make a decision. Rather than going through cryptocurrency exchanges, these stocks can be traded right from your brokerage account. 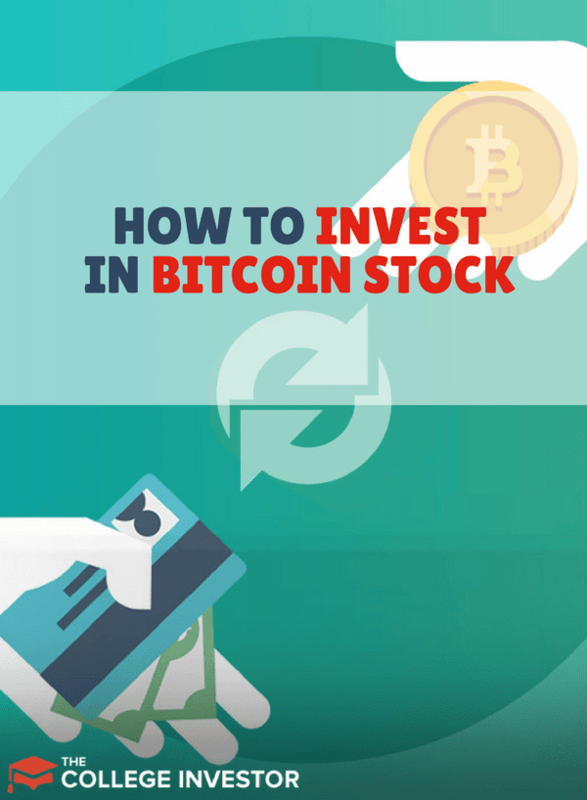 Have you thought about investing in Bitcoin stock? Why or why not?